"A dynamic one-of-a-kind entertainer, Jane enchants audiences of all ages!" Welcome! Thanks for stopping by! It's always an honor for me to perform for such amazing kids and their equally fun parents all over the Greater New York Area. Customized 30 to 50 minute shows now available year round in New York, New Jersey, Connecticut, Pennsylvania, and periodically in Florida and New England. Award winning songwriter-puppeteer-musician Jane Stratten is a unique entertainer who combines puppets, music, and audience participation in her shows. Jane brings her musical theater stage to you! 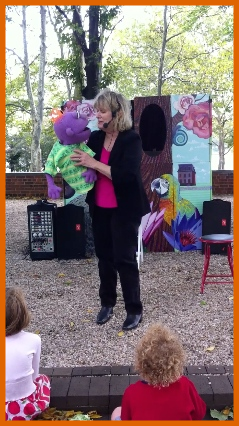 Children "get" the puppets on different levels- the very young children are fascinated by Jane's big variety of colorful puppets and songs, while the older children see the puppets as funny, irreverent, outrageous, and sometimes, yes, even obnoxious. Check Out Jane's New York Company Below!